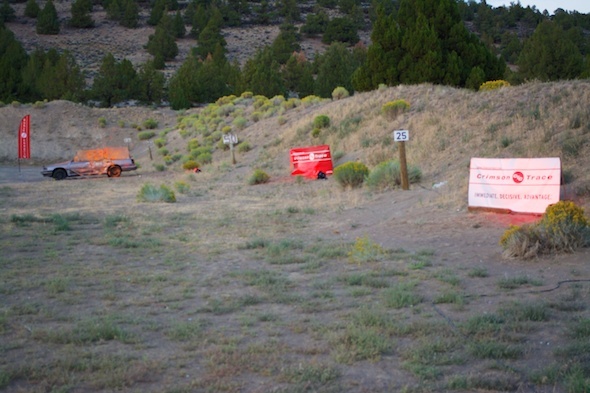 I just finished shooting and covering the Crimson Trace Midnight 3 Gun Invitational in the high desert miles and miles from Bend, Oregon. It was an enlightening experience, and I’ll write about that in my weekly column on OutdoorHub.com. 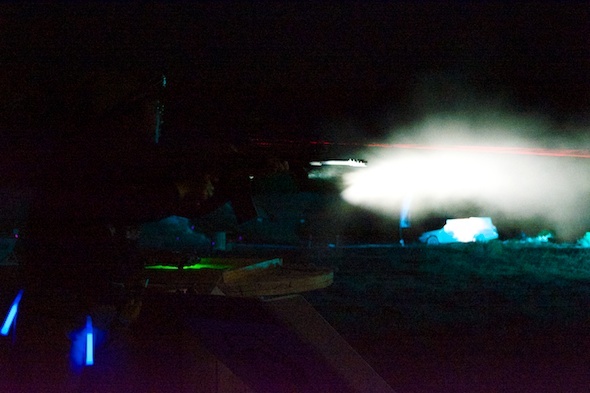 Shooting at night was also ridiculously fun. More fun than should be legal, perhaps. To give you an idea of what it was like, let’s look at just one of the 9 stages of the event. Keep in mind, this all happens in the pitch dark between 9pm and 3am. It almost looks easy. In the daylight. Hey, the following scenario could happen in real life. Right? First, pick up your fully automatic SCAR, equipped with light and laser of course, and engage two, two-dimensional (cardboard) bad guys. That’s an easy one, problem solved! There are not too many problems a grenade launcher won’t solve. But wait, as you’re putting down your SCAR to celebrate your success with a post engagement cookie, you notice a car full of evildoers intent on doing you harm. Fortunately, you have an FN grenade launcher loaded and ready for action. 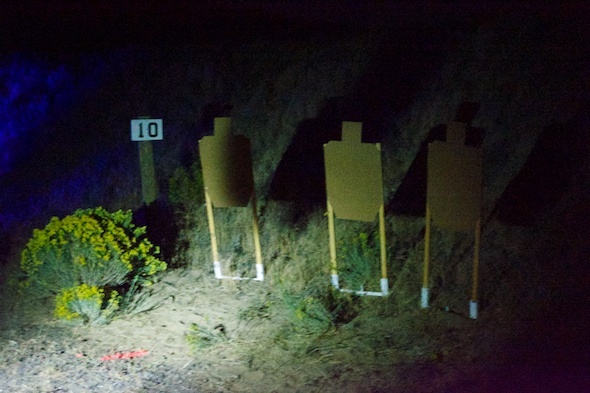 From about 50 yards away, using a Crimson Trace RailMaster green laser aiming system, lob a 40mm grenade through the driver side window. Problem solved. But hordes of evil two-dimensional dudes are called hordes for a reason. You see more headed your way. You notice 8 of them about 20 yards away. Drawing your Glock 17 equipped with Crimson Trace Lasergrip and Lightguard, you sprint in their direction and hit each twice while on the run. 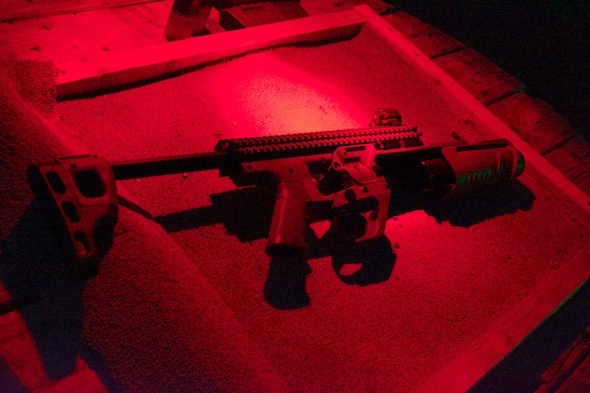 Good thing you have a pistol mounted light as they’re blending into a sandy berm, and hard to spot. These evil d00dz are about to get SCARed in full auto mode. But, as you can probably guess, there is no rest for the weary. 8 ground-dwelling DHS drones, looking deceptively like steel plates set in the ground, are headed your way. As you continue to move towards the threats, you take out a couple of them with the remaining rounds in your Glock. And that’s when the real trouble starts. Your Glock runs dry, and there are still drones to engage. No worries, just grab your Lightguard equipped shotgun. While heading down the dark path, whack em’ with some bird shot loads. and take them out. It’s only then that you spot 8 NSA disk drives with recordings of all your most personal online conversations, cleverly disguised as 4 inch clay targets. These are scattered across a wide area in the sand, so it’s a good thing you have a tac lite to spot them. This is how the stage looks in the dark. You can easily see the need for lights and lasers! After you deal with those you can take a brief rest, until the next stage. And so it goes. 9 different stages designed to force reliance on lights, lasers and skill. Just for fun, there’s a daylight hours side match, where you clear six buildings with a fully automatic PWS Diablo short barrel rifle. As you have daylight on your side, that seems easy in comparison. Running around the desert shooting all night long is exhausting. But given the chance, count me in to do it again!